Our first Sunday in Hsinchu we decided to take the bike and drive out to nearby Beipu. 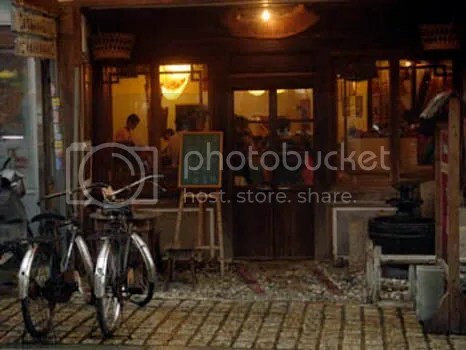 It is famous for being the center of Hakka culture in northern Taiwan and a good place to sample some Hakka food. 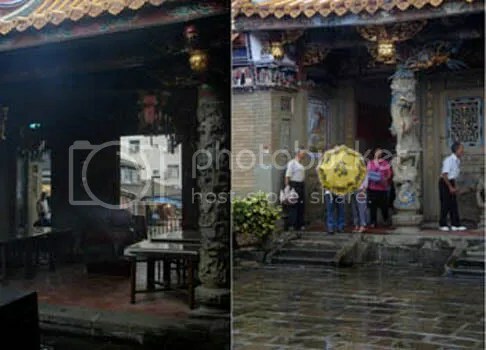 We arrived to a drizzly and gray Beipu, where I’ve never been despite its closeness to Hsinchu, and started walking around the streets, busy with other day-trippers who were not deterred by the wet weather. The streets were lined with numerous stands selling juices, local vegetables, snacks and tourist souvenirs. We stopped to sample a couple of buns before heading to Fanpokeng Tavern, one of many attractive teashops in the town, for lunch. 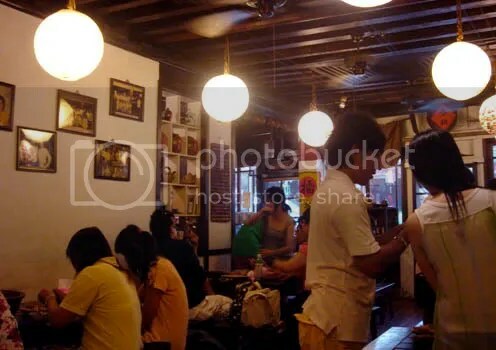 It is a lovely shop with red brick and white walls, wooden ceilings and red tiled floors, decorated with wooden benches and tables and some antiques displayed throughout. The atmosphere was warm and pleasant as tables of friends and family were sitting around enjoying drinking and making lei cha. Lei cha is a famous Hakka tea, originating in China. It’s also known as ground tea, combining green tea with a paste of peanuts, sesame, sunflower and pumpkin seeds. Despite it sounding a little strange it is most enjoyable, although you have to work to enjoy it! The staff places a stone grinder on your table with some dried tea leaves in it. You begin by grinding this into a powder. Next you add the plateful of seeds until grind it into a smooth paste. The staff, despite being very friendly, pretty much flat-out refuses to do anything besides checking your progress. Understandably though, as this is a long and exhausting process! It does add to a feeling of camaraderie as other patrons lean over on another’s shoulders to see how the table next to them are doing, or in our case, offering help in how to grind! Once our waitress was happy with our paste she added hot water and gave us some popped rice. 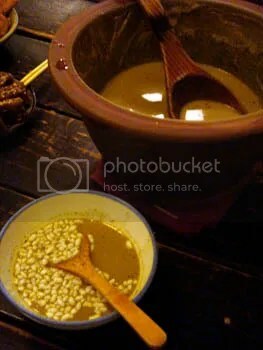 The paste and water gets stirred together and served in a bowl with a spoon and some rice on top. Delicious and very filling! I highly recommend it! We also ordered some snacks, the menu was all in Chinese, so I tried to ask the waitress to suggest some items, which worked very well. 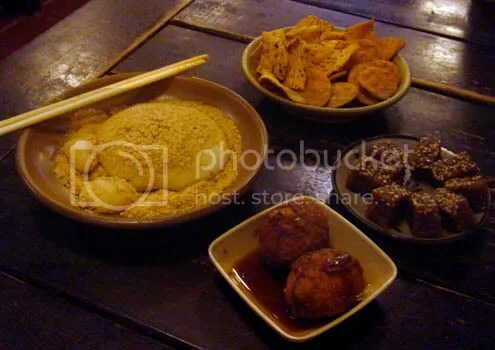 She brought out a plate of maji, or sticky rice rolled in ground peanuts along with fried eggs and another rice snack. We tried our best to finish everything, but in the end we had to leave some food. Turns out lei cha is a meal in itself!